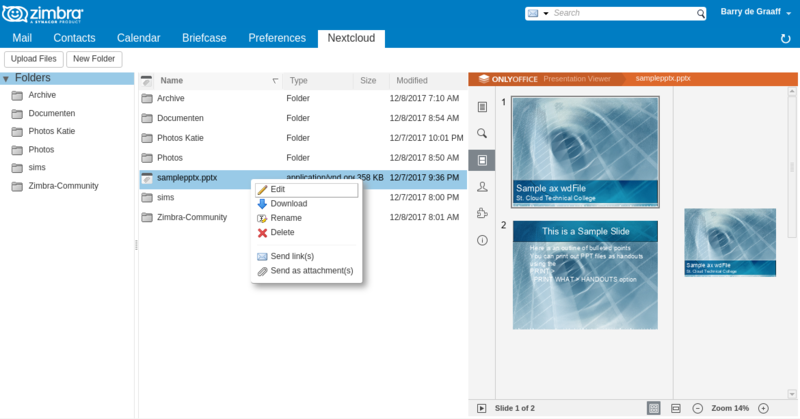 Now that Zimbra Drive is released as an installation option in Zimbra Open-Source edition, I often talk to people that are not aware that Zimbra Drive is developed separately from Nextcloud Zimlet (Zimbra WebDAV Client). While both products allow you to integrate Nextcloud/ownCloud in your Zimbra, there are some differences. That I’ll show you in this post. Markdown yes* no *Support rendering Markdown. Directly edit from Zimbra, the text source file. Zimbra WebDAV Client now fully supports previewing in OnlyOffice (Screenshot). In my experience, Collabora (LibreOffice) creates documents that are 100% compatible with LibreOffice, while OnlyOffice creates documents that are 100% compatible with Microsoft Office. In addition when one exports to a PDF the documents from Collabora are more compatible with jsPDF (so you can embed it in WordPress). If it comes to the configuration, Zimbra Drive is pre-configured by the administrator that can set the Nextcloud servers to use per cos/domain etc. Zimbra WebDAV Client allows the admin to set default settings (can be based on Zimbra’s public URL) and set a list of allowed domains. The user is able to configure the settings of Zimbra WebDAV Client to use whatever Nextcloud desired (if the admin allows the domain). Did I overlook a feature? Comment below and I add it to the table. Hello All, in this first Zeta Alliance post I am going to show you how to install a Virtual Server with OnlyOffice. The VM will be using Let’s Encrypt for SSL, and the certbot renew cycle is used to update the docker image as well. The final idea is to use Zimbra WebDAV Client (Nextcloud Zimlet) together with OnlyOffice for online document editing. I’ll blog about the Nextcloud Zimlet another time. The VM will need a public port 443 and 8443 exposed to the Internet and I recommend to put it on a separate IP and domain name. You MUST use port 443, but in place of 8443 you can use any port that is higher than 8000. The VM is kickstarted and the SSL certificate is generated from Let’s Encrypt. Why? Because let’s encrypt does include a working certificate chain AND removes weak ciphers from the cert. This results in less configuration, or you can say OnlyOffice does not work with weak ciphers, broken chains and or wildcard certs. yum groupinstall "Basic Web Server"
Apache stays on port 443, because that works with Let’s Encrypt. Now you can look at https://onlyoffice.domain.com:8443/welcome/ and see the Document Server running. Install and configure OnlyOffice app under Office apps in Nextcloud and configure under Admin, the server url. Done! After editing configuration file use the command ‘supervisorctl restart all’. As you are using Docker version at first enter the container with ‘docker exec -it container_ID /bin/bash’ and then perform previously mentioned operations. Thank you for the interest in ONLYOFFICE. 3 3 * * * /usr/bin/certbot renew --post-hook "/usr/local/sbin/refresh_docker.sh"
To integrate this OnlyOffice in Zimbra, you must set the owncloud_zimlet_enable_onlyoffice property to true, you can find instructions here.